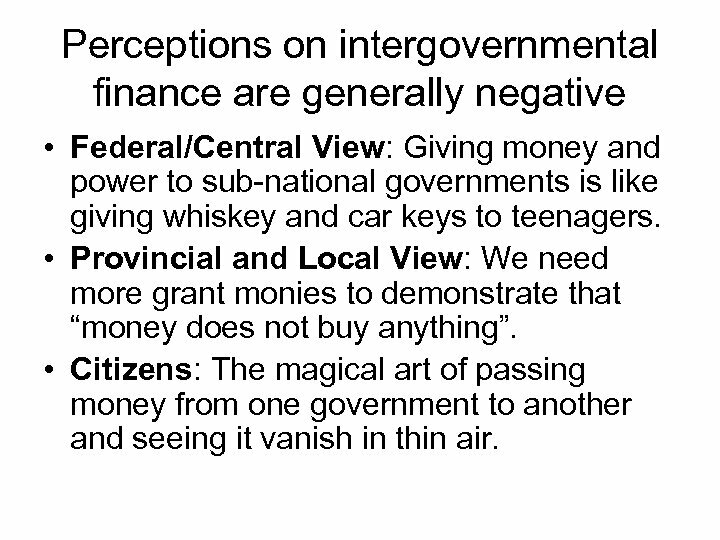 Perceptions on intergovernmental finance are generally negative • Federal/Central View: Giving money and power to sub-national governments is like giving whiskey and car keys to teenagers. 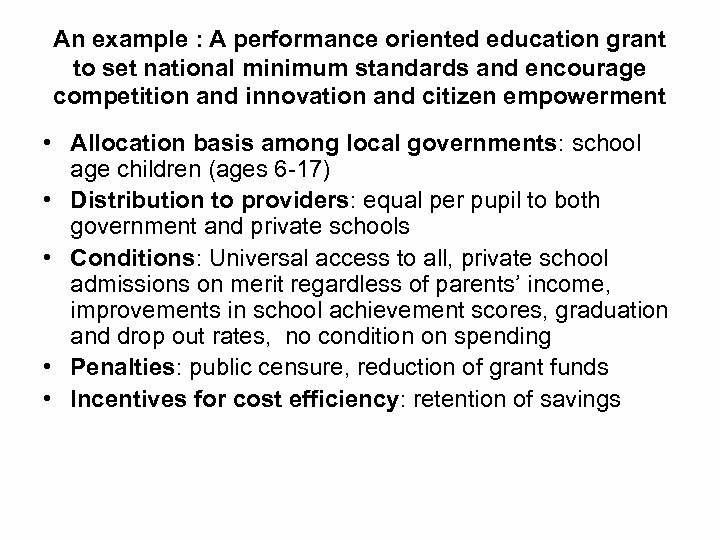 • Provincial and Local View: We need more grant monies to demonstrate that “money does not buy anything”. 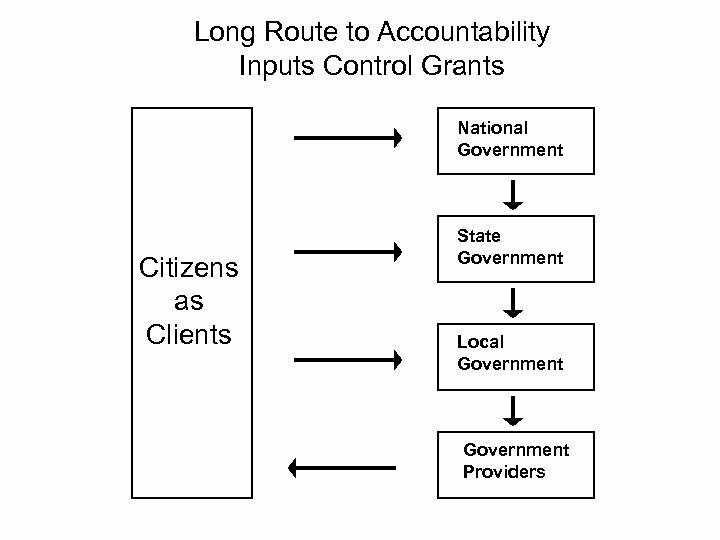 • Citizens: The magical art of passing money from one government to another and seeing it vanish in thin air. 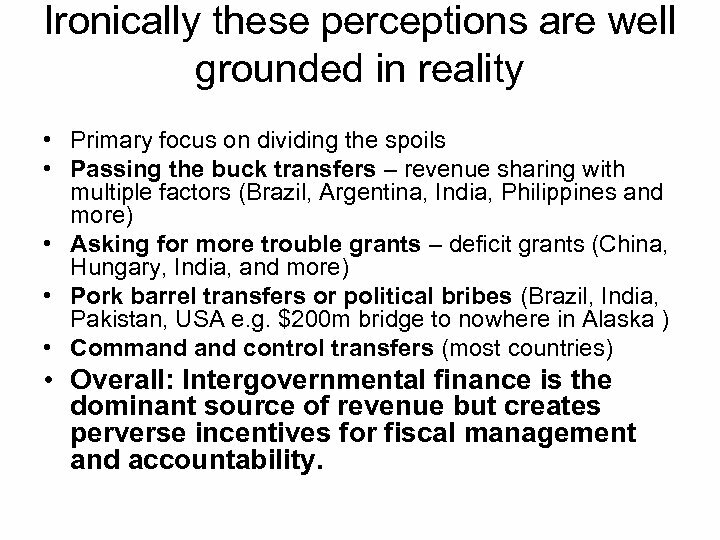 Ironically these perceptions are well grounded in reality • Primary focus on dividing the spoils • Passing the buck transfers – revenue sharing with multiple factors (Brazil, Argentina, India, Philippines and more) • Asking for more trouble grants – deficit grants (China, Hungary, India, and more) • Pork barrel transfers or political bribes (Brazil, India, Pakistan, USA e. g. $200 m bridge to nowhere in Alaska ) • Command control transfers (most countries) • Overall: Intergovernmental finance is the dominant source of revenue but creates perverse incentives for fiscal management and accountability. 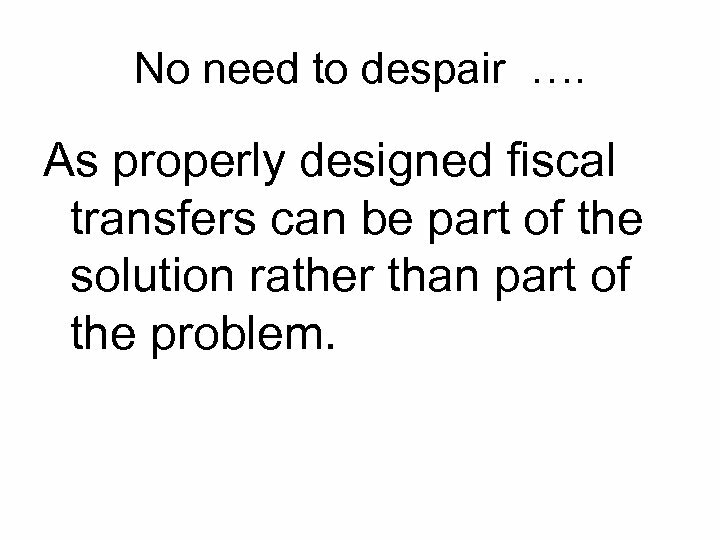 No need to despair …. 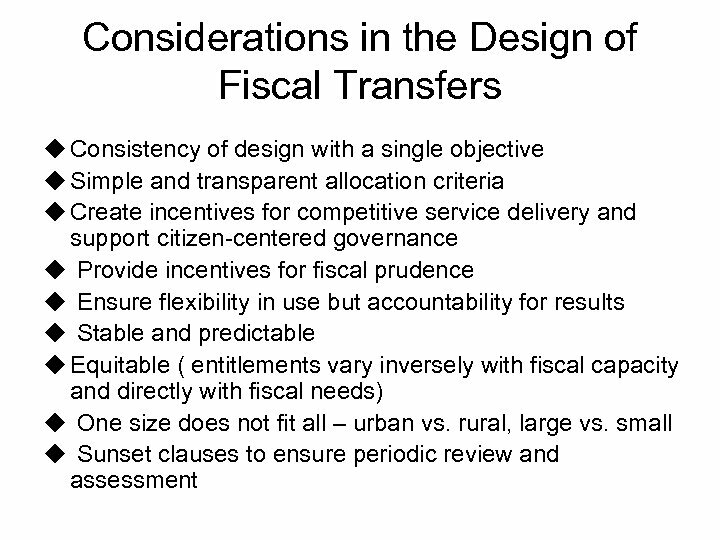 As properly designed fiscal transfers can be part of the solution rather than part of the problem. 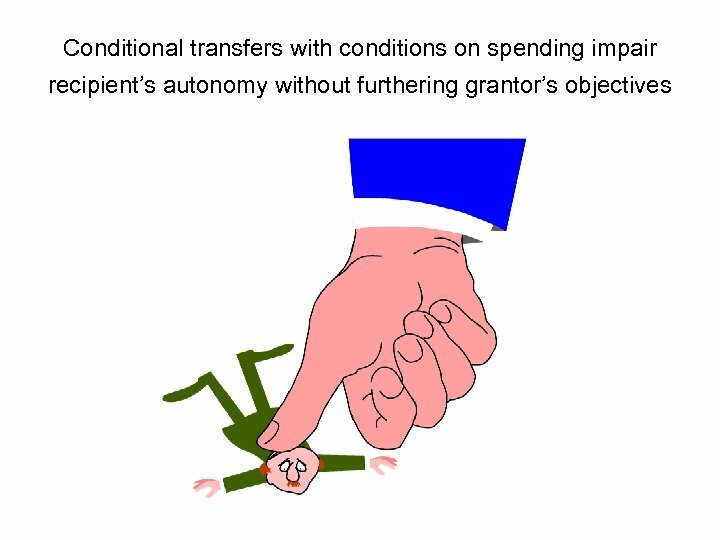 Transfers to deal with fiscal gap u Fiscal Gap: Structural imbalance as a result of a mismatch between revenue means and expenditure needs. 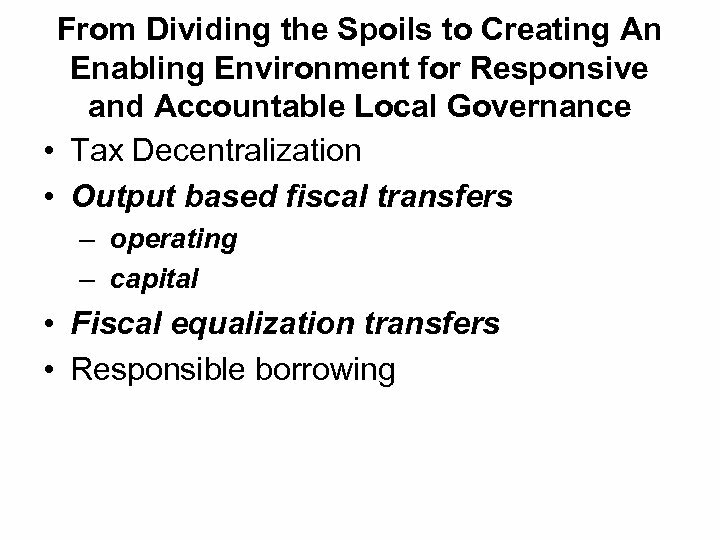 Reasons: Inappropriate assign: Reassign Limited tax bases: Allow joint occupancy or tax decentralization. 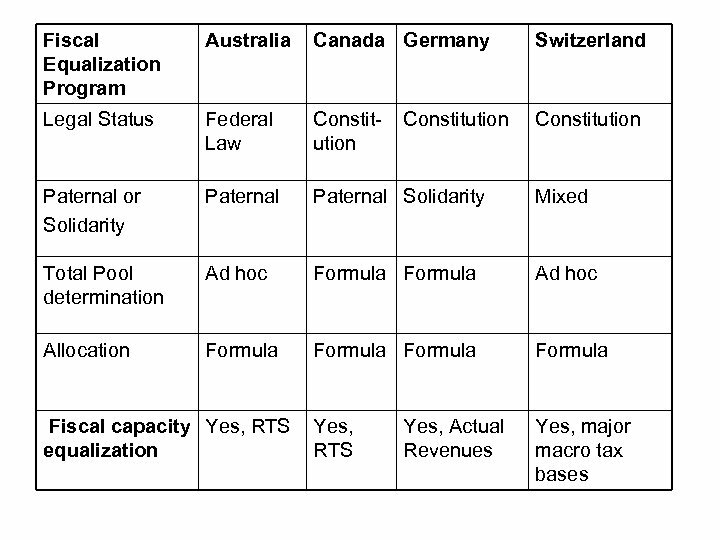 Tax competition: Federal collection and general (not on a tax-by-tax basis) revenue sharing. 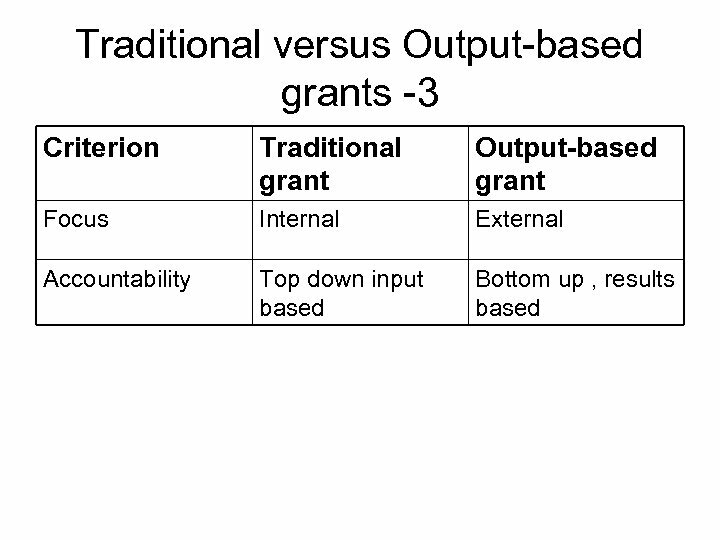 Tax room lacking: Tax abatement and tax base sharing (Canada ). 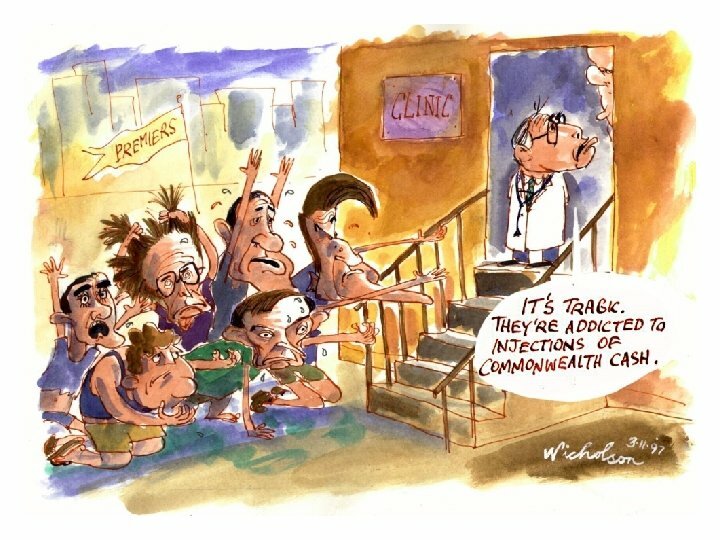 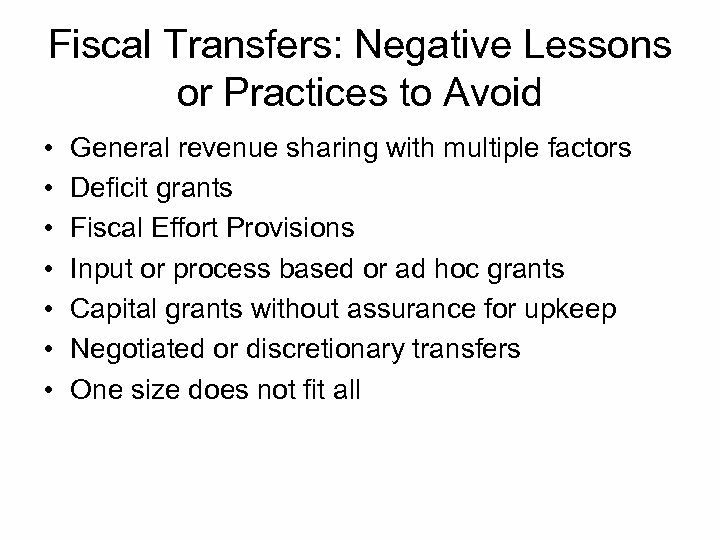 Practices to avoid: deficit grants; tax by tax sharing. 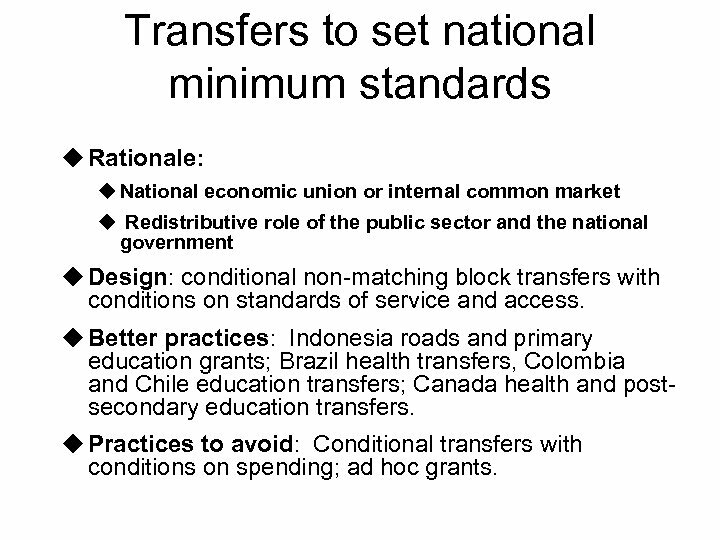 Transfers to set national minimum standards u Rationale: u National economic union or internal common market u Redistributive role of the public sector and the national government u Design: conditional non-matching block transfers with conditions on standards of service and access. 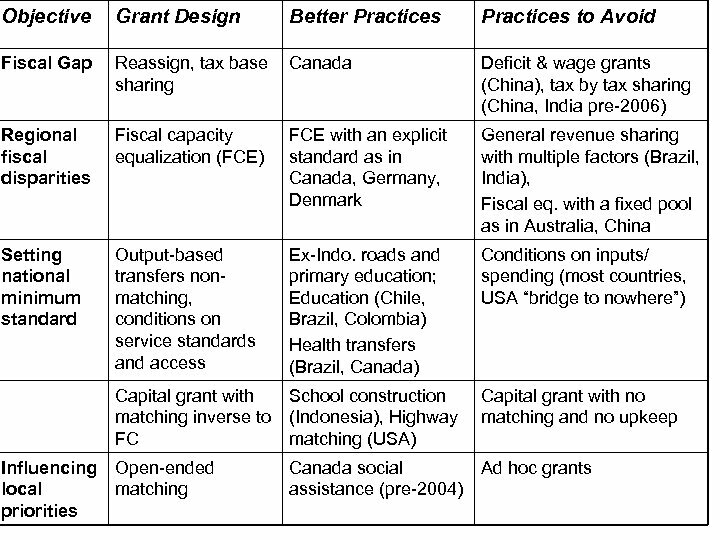 u Better practices: Indonesia roads and primary education grants; Brazil health transfers, Colombia and Chile education transfers; Canada health and postsecondary education transfers. 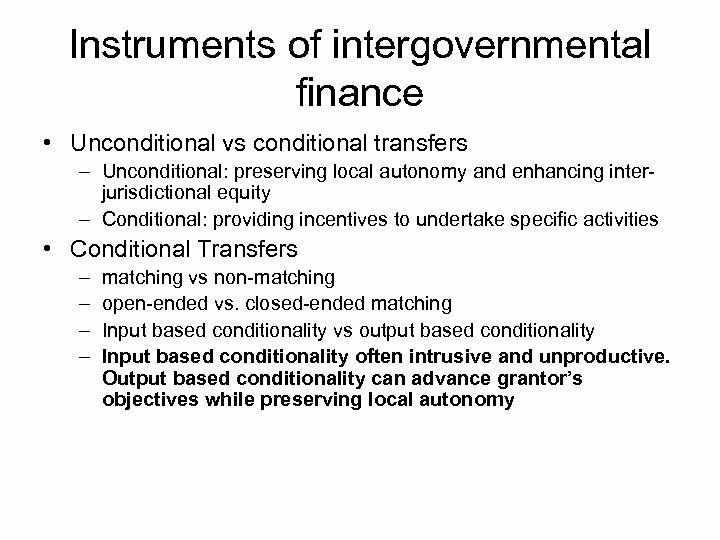 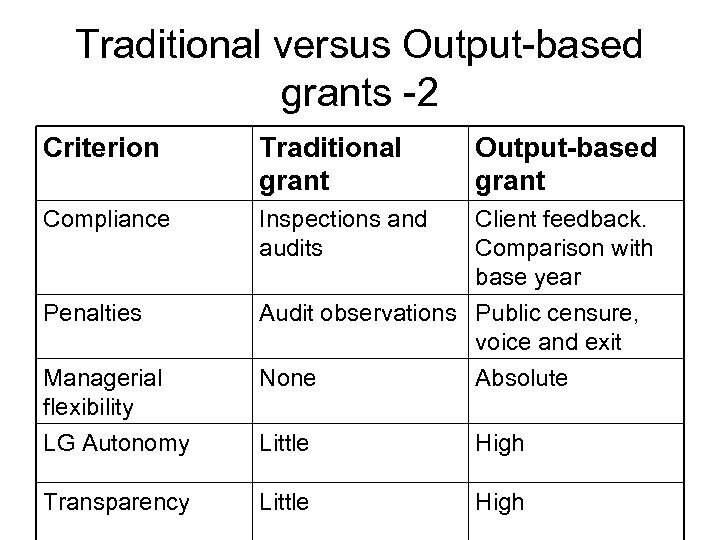 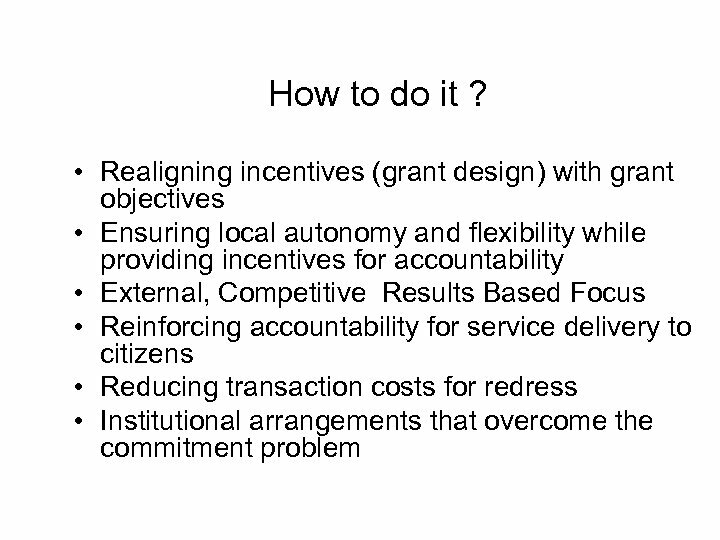 u Practices to avoid: Conditional transfers with conditions on spending; ad hoc grants. 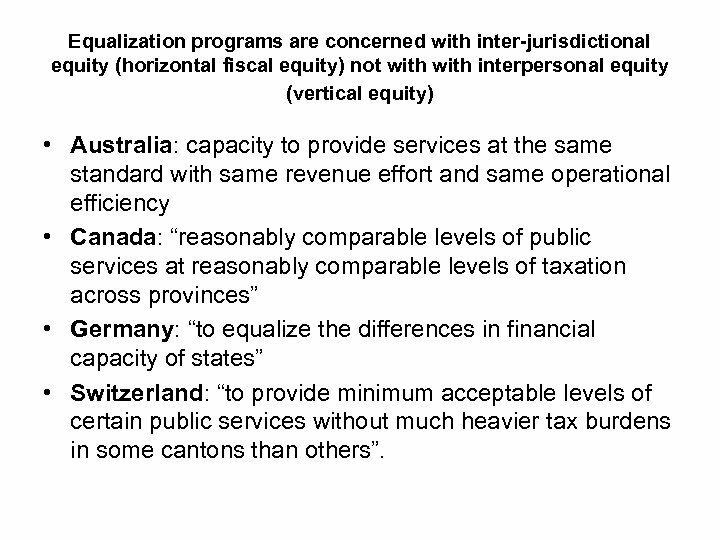 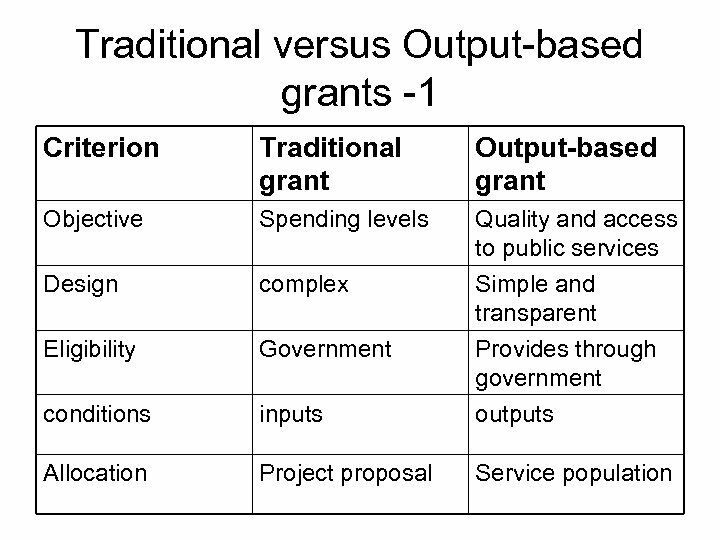 Equalization programs are concerned with inter-jurisdictional equity (horizontal fiscal equity) not with interpersonal equity (vertical equity) • Australia: capacity to provide services at the same standard with same revenue effort and same operational efficiency • Canada: “reasonably comparable levels of public services at reasonably comparable levels of taxation across provinces” • Germany: “to equalize the differences in financial capacity of states” • Switzerland: “to provide minimum acceptable levels of certain public services without much heavier tax burdens in some cantons than others”. 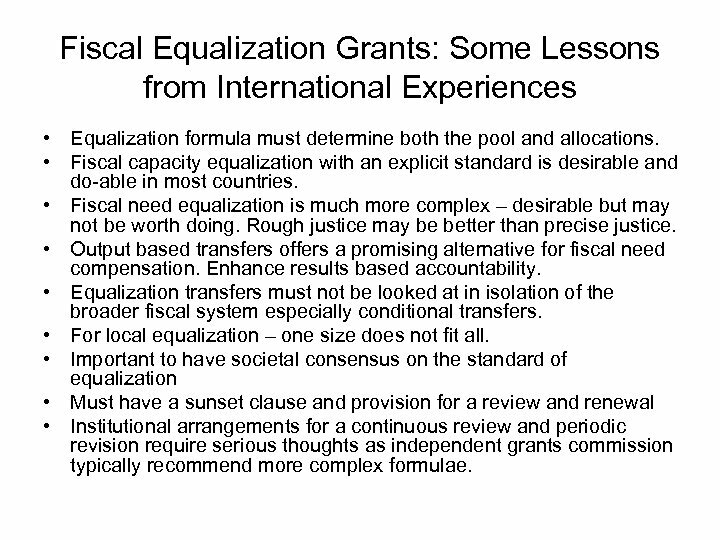 Fiscal Equalization Grants: Some Lessons from International Experiences • Equalization formula must determine both the pool and allocations. 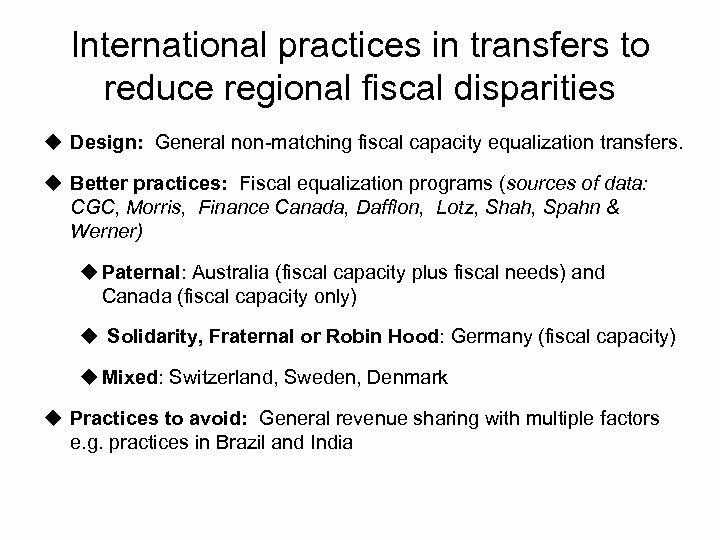 • Fiscal capacity equalization with an explicit standard is desirable and do-able in most countries. 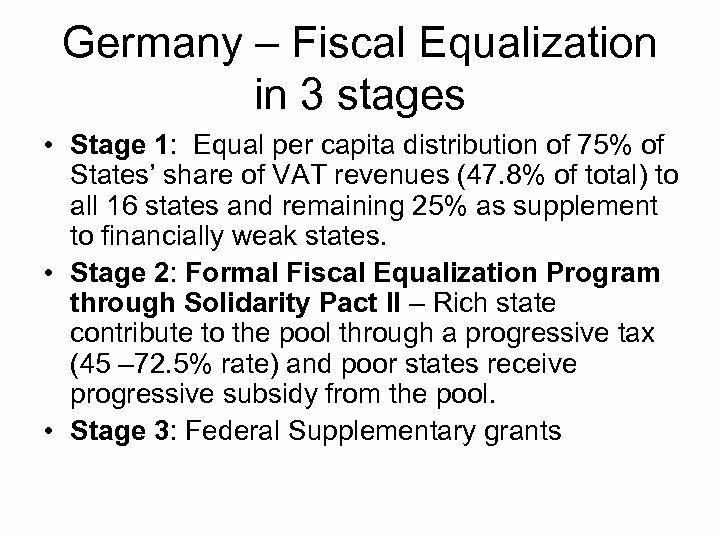 • Fiscal need equalization is much more complex – desirable but may not be worth doing. 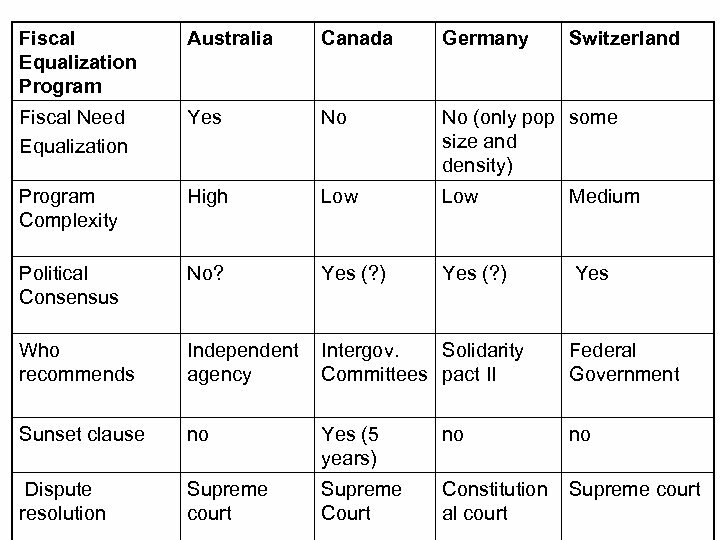 Rough justice may be better than precise justice. 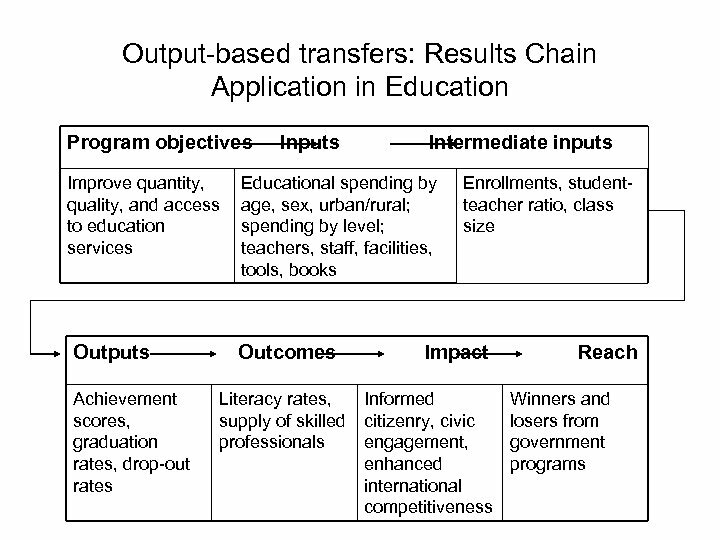 • Output based transfers offers a promising alternative for fiscal need compensation. 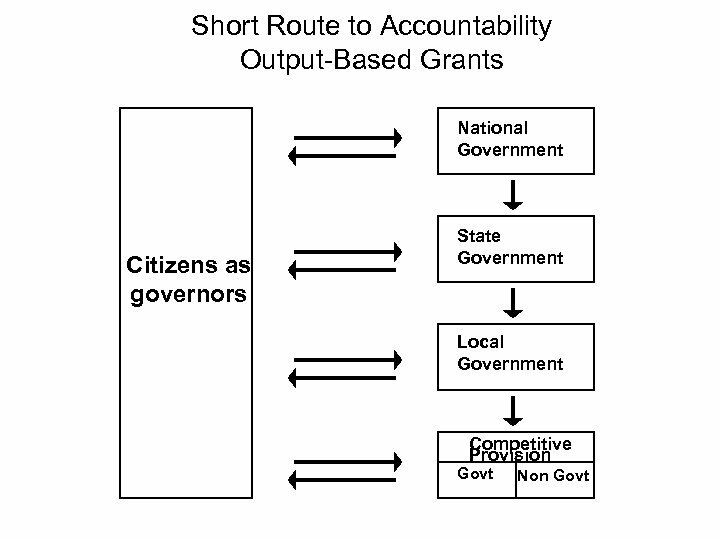 Enhance results based accountability. 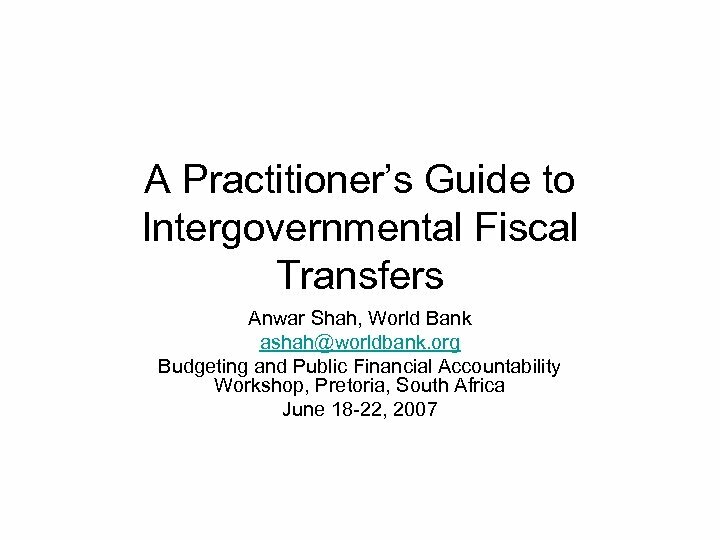 • Equalization transfers must not be looked at in isolation of the broader fiscal system especially conditional transfers. 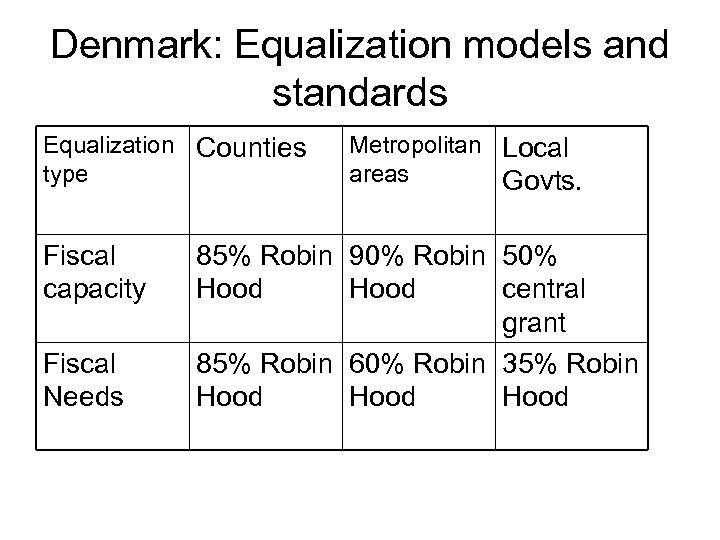 • For local equalization – one size does not fit all. 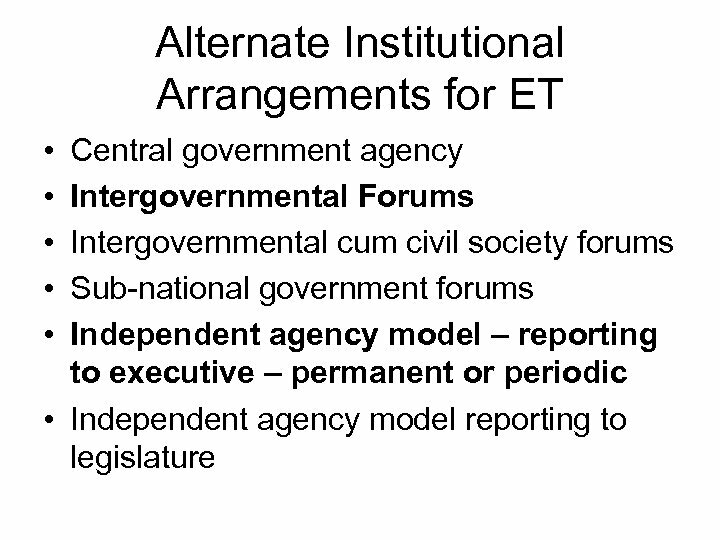 • Important to have societal consensus on the standard of equalization • Must have a sunset clause and provision for a review and renewal • Institutional arrangements for a continuous review and periodic revision require serious thoughts as independent grants commission typically recommend more complex formulae.